I'm so excited! 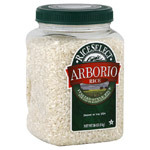 I just put arborio rice on my grocery list and I'm making this ASAP. I, too, tried risotto once and was repulsed, and so automatically flipped past any recipes or menu options involving "the R word". I hope my family likes it as well as your did! I'm actually a huge fan of risotto. I make it as often as I can, full of parmesan cheese and spinach. I'm glad you found non-pebbly risotto. Kids do seem to have that mutant superpower. I like risotto. I have made it, too, but it seems like a lot of work. I would rather order it. I just started making risotto last year in my electric pressure cooker. I'm not brave enough to make it on the stove. Gordon Ramsey would probably call me a Donkey! I've got to try that. My sister keeps telling me that it's really, really good, but I have yet to taste it. I love a good risotto. I had no idea it was all technical. I too am a foodnetwork junky. I have also been known to watch Hell's Kitchen. And after a couple of seasons of watching Chef Ramsey yell at cooks who could not cook risotto I decided to give it a try. The family loved it! What I can't figure out is why none of these cooks on TV can seem to make it!